Right Approach for Accounting, Statistics or Finance Homework – Eduistic: Need Expert Help with your Studies? 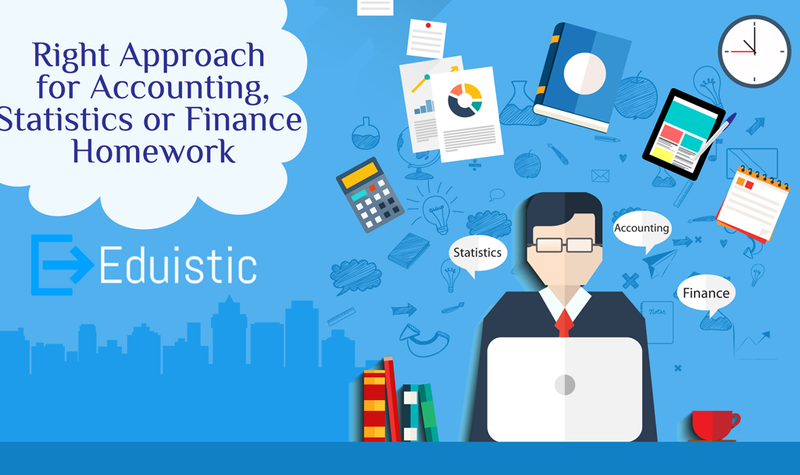 An Accounting, Statistics or Finance Homework needs to be written very precisely. It can range from a simple solution to a numerical problem or an advanced financial analysis and depiction of financial models. When an assignment is written on the topic, there are a few cardinal do’s and don’ts s which must be paid attention to as an incorrect approach may deviate from the correct approach by just a little, but the impact it might have on the net result can be massive. The most practical approach is to keep in mind and adhere to the object of the assignment. When any statistical, financial or accounting data is being dealt with, the common thing that can be found is that each step has a link to the next one. In case one step goes wrong, the resulting steps would definitely lead to an incorrect information or conclusion. The primary idea to be kept in mind is to have a step-by-step approach, all of which must be clearly outlined. Creating an outline keeps the assignment well organized. Organization of information is of high importance. Since the work done, is mostly in steps and needs to be sorted in order to make any sense, a proper organization saves ample time. From a statistical or financial standpoint, the objective of the assignment is to test the reasoning, analytic and conclusive power of the student. In a Financial/Accounting assignment, topics such as Corporate Risk, International Financial Markets, Portfolio Management, and Financial Statement Analysis are generally included. Whereas the topics such as Probability, Mean Difference, Modal Selection, Spatial Analysis, Deviation are covered in a Statistical assignment. Inclusion of Figures such as graphs and charts, and tables is another effective form of alleviating the presentation of the assignment. A visual representation of data lends a perspective. Not only does a tabular representation look more professional, but also it provides the relevant information at a glance and is most certainly less time consuming. A tabular representation must not be vague, irrelevant, inconclusive, or confusing. Therefore, while incorporating tables or charts, the above-mentioned points must be adhered to. As stated previously, the object is to work upon the given data, derive one form of data from the other and draw conclusions based thereupon. This is the part wherein, analytic and conclusive powers are put to a test. Therefore, it is a must for a student to ponder upon and conceptualize the given topic as much as possible. All the work done and efforts put into the assignment would be an absolute waste if a conclusion cannot be reached upon. Having a critical thinking is a key requirement in all kinds of home-works. It gives the assignment the cutting edge- an intellectual approach which enables the selection of relevant and the most-agreeable piece of information. In the end, when writing the conclusion, it must be clearly stated, in accordance with the title.